FOR A MOVEMENT THAT THE ECONOMIST magazine has declared may “herald a new industrial revolution,” there appears to be an inordinate amount of fun in the maker world, at least in the examples on view at the recent World Maker Faire 2012. Apart from the rolling cupcake-mobiles and the explosive “science” involving Diet Coke and Mentos, there were robots dancing Gangnam Style, a range of steampunk gadgetry and clothing, and a large number of—not to put too fine a point on it—toys. Play appears to be a central value for makers, for many it may be a blast of fresh air from the spreadsheets and word processors of “adult” worklife. Get in your garage, create a robot or an autonomous helicopter, assemble a music machine that uses sunlight to generate music, put some flashing lights on your t-shirt that advertise your heartbeat. Why not? Robot makers engineering the future at the booth of Brooklyn Robot Foundry. 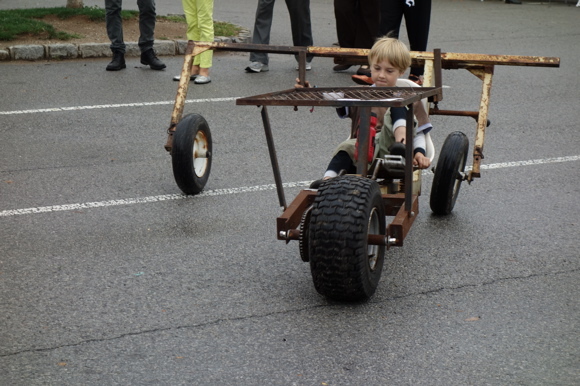 In fact, of the many perspectives on fun at Maker Faire, the one from sub-four-feet was ever-intriguing, as thousands of children can attest. 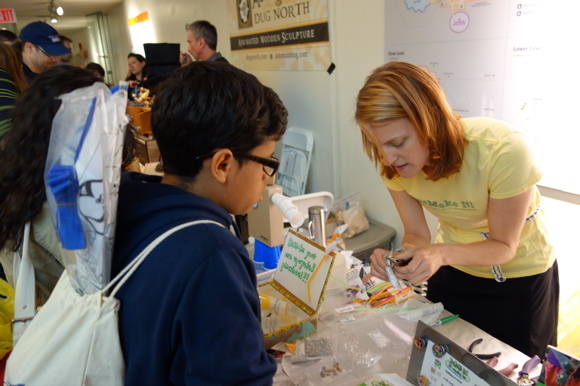 Brooklyn Robot Foundry was a substantial presence at Maker Faire, winning two Educator Awards, bringing electronic and mechanical engineering down to the grade school level. The idea that you could have a personalized bot is a radical notion for someone like me who remembers the massive car-assembling industrial robots demonstrated at the 1960s World’s Fairs. The expansion of high technology to encompass low and medium technology is the developing story of this decade, and Brooklyn is obviously ground zero. The Robot Foundry itself is located at 3rd Avenue between 1st and Carroll, providing after-school programs, classes, and even robot parties to the aspiring engineer. Tiffany Threadgould, self-proclaimed “design junkie” helped young makers build pinwheels from scrap materials. Another Brooklynite who catered to the littlest makers at the Faire was Tiffany Threadgould, self-described “design junkie” who turned junk into toys at the Maker Faire. She used her RePlayGround concept of “upcycling” abandoned materials to create little pinwheels. Farm Hack, a group of innovators associated with the National Young Farmers Coalition who create new technologies for sustainable farming, focused at the Faire on harnessing kid energy for farm implements. 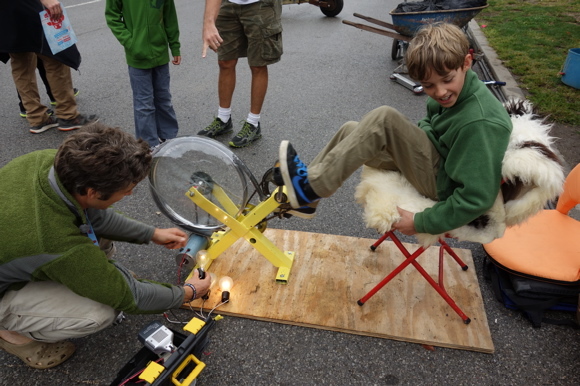 At their booth, which also garnered educator awards, kids were eager to replace horses and tractors to pilot pedal-powered tools, or generate enough electricity to light if not a barn, at least a shed. Farm Hack is planning a more elaborate urban farming event in Brooklyn on November 10-11 and Brooklyn Artisan will be there. Kid-driven farm implements are the new go-karts. 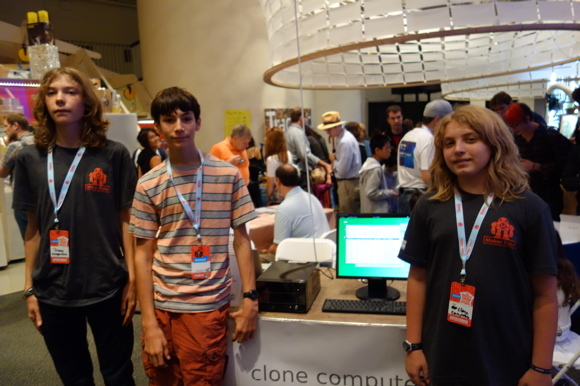 Louis (15), Gavin (15), and Gio (14) showing off the Clone One at the Clone Computers booth.